Environmental alarm bell, artwork or both? With a team of scientists, artist Kelly Jazvac makes a newly discovered ‘rock’ art’s latest Readymade. 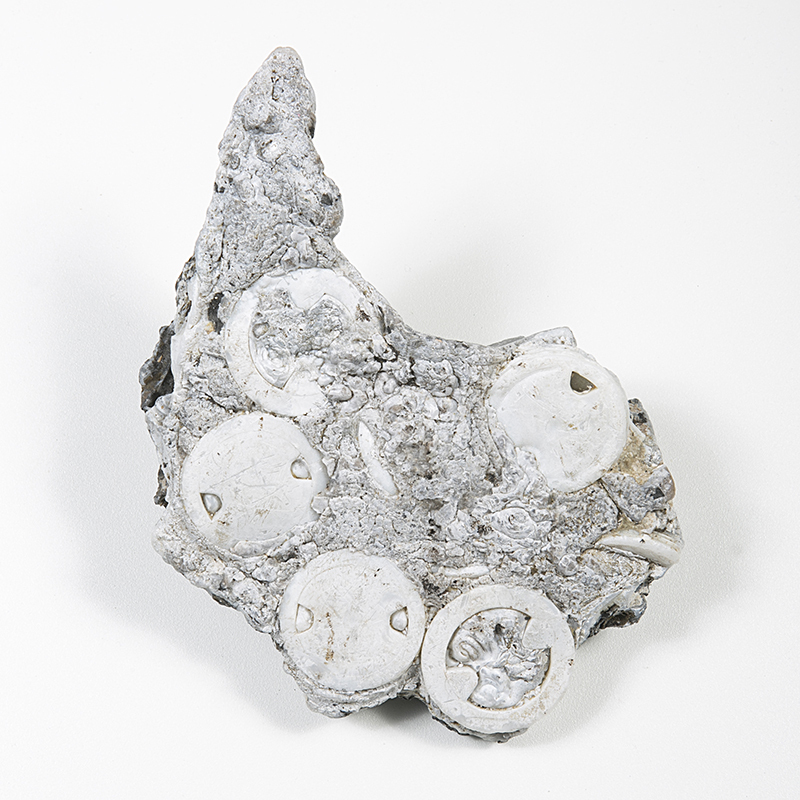 Kelly Jazvac: Plastiglomerate Samples (2013). Plastic and beach sediment, including sand, basalt rock, wood and coral. All of these found-object artworks are the result of a collaboration between Jazvac, geologist Patricia Corcoran and oceanographer Charles Moore. Photos: Jeff Elstone. The seminal French artist Marcel Duchamp was, among other things, a trickster par excellence. Drawn into the Dada movement’s embrace of absurdity, rejection of Nationalism, and assault on tradition, Duchamp culled from the world around him, making art from everyday found objects. From these he would create “readymades”: already-made, mass-produced or manufactured stuff transformed into “art” simply because he, as an artist, said it so. While many people recognize Fountain (1917), a porcelain men’s urinal flipped on its back, signed “R. MUTT,” and placed in an art gallery, Duchamp’s first readymade was created in 1913 under the title Bicycle Wheel. Here, Duchamp mounted a metal bicycle wheel onto a painted wooden stool; however, that one simple gesture changed everything. His statement on the marriage of materials was as much aesthetic as it was prophetic: “I had the happy idea to fasten a bicycle wheel to a kitchen stool and watch it turn.”2 By combining common industrial materials to produce a sculptural object, Duchamp completely redefined just what art, design and craft really is. 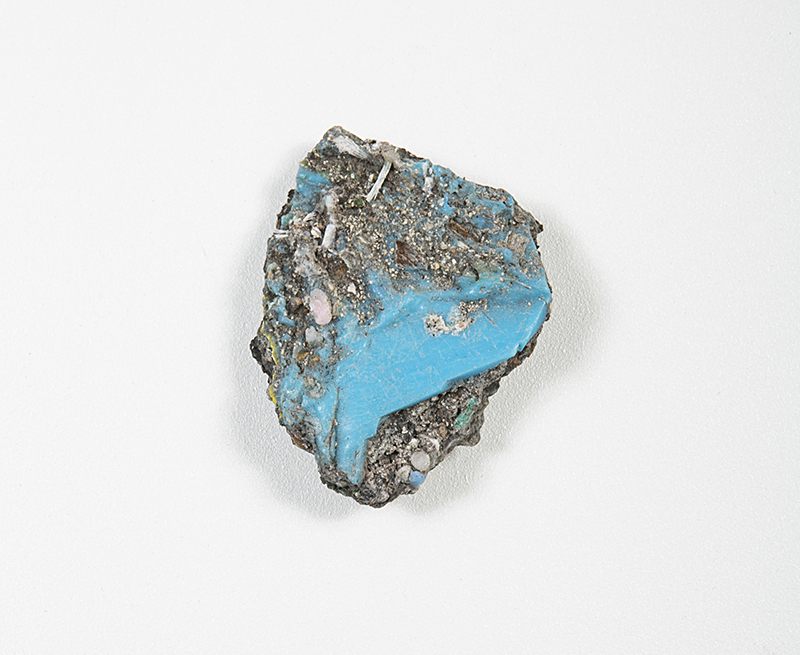 Kelly Jazvac: Plastiglomerate Sample (2013). Plastic and beach sediment, including sand, basalt rock, wood and coral. 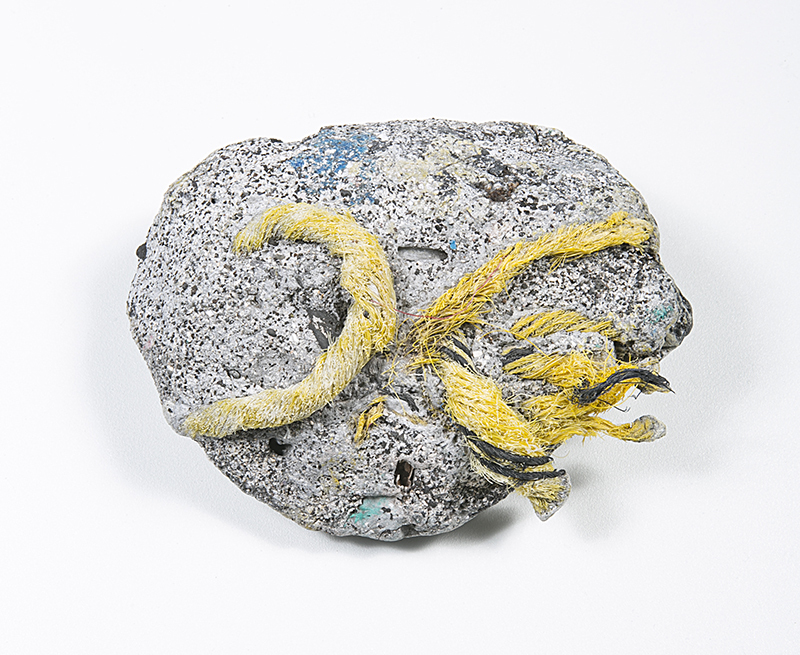 London, Ontario-based visual artist and Western University Professor Kelly Jazvac has recently displayed plastiglomerate as readymade art objects at SECCA in North Carolina; Art Museum at the University of Toronto; Carleton University Gallery in Ottawa; Projekstrom Normanns in Norway; Louis B. James Gallery in New York; and Oakville Galleries’ Gairloch Gardens. Jazvac has employed salvaged plastics, the readymade, and other mass-produced materials, including Plexiglas and cardstock, in her rich body of work since 2005. However, she first embarked on this new direction of research after Western University Earth Sciences Professor Dr. Patricia Corcoran invited noted oceanographer Charles J. Moore of the Algalita Marine Research Institute in Long Beach, California to speak publicly on plastics pollution at the university in 2012. Moore presented a slide featuring a strange brew of plastics bound together with natural materials from Kamilo Beach. As of then, it did not yet have a name, nor was there a clear understanding of how it was formed. Moore’s hypothesis was that lava from nearby volcanoes was in fact melting plastics washed ashore on the beach and, therefore, nature itself rather than the human population was remedying its own pollution problem. According to the findings of their research, published by the Geographical Society of America, plastics are essentially synthetic organic polymers used in mass-produced consumer goods that hold potential to break down mechanically, chemically or, to a lesser degree, biologically over hundreds or even thousands of years. It happens that Kamilo beach is enveloped with small plastics debris known as “plastic confetti,” which litters the land, vegetation and sand in a rainbow of over-consumption, a metaphor for our times. 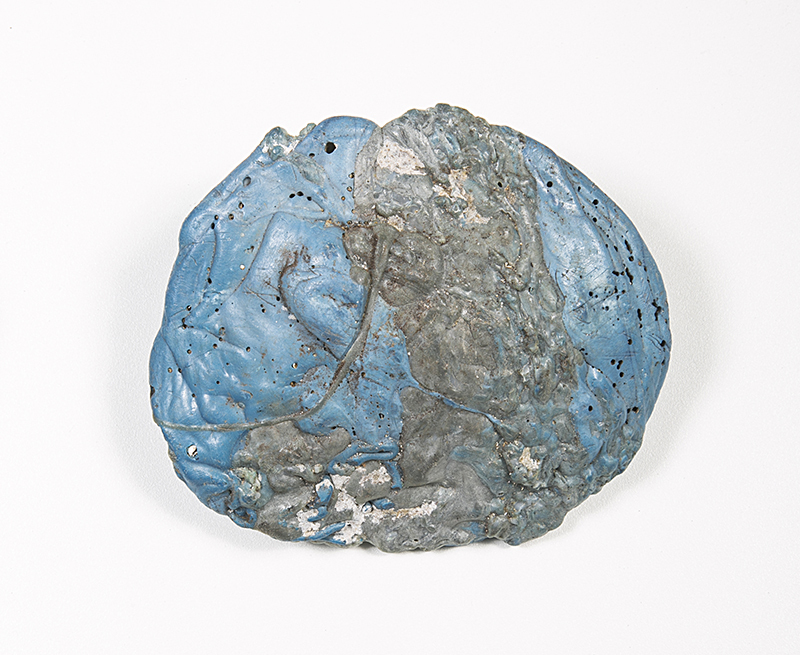 In a different way, Jazvac’s readymade plastiglomerate works are sinister prophesies of apocalyptic futures, and perhaps this is what she means by “haunting.” They are spectres of over-consumption, waste and the accumulation of things. They prey upon the viewer as small metaphors of gluttony; they read as manifestos for irresponsibility. It’s taken a century to see how far we’ve come. Here is the evidence: tangled webs of plastic and stone. 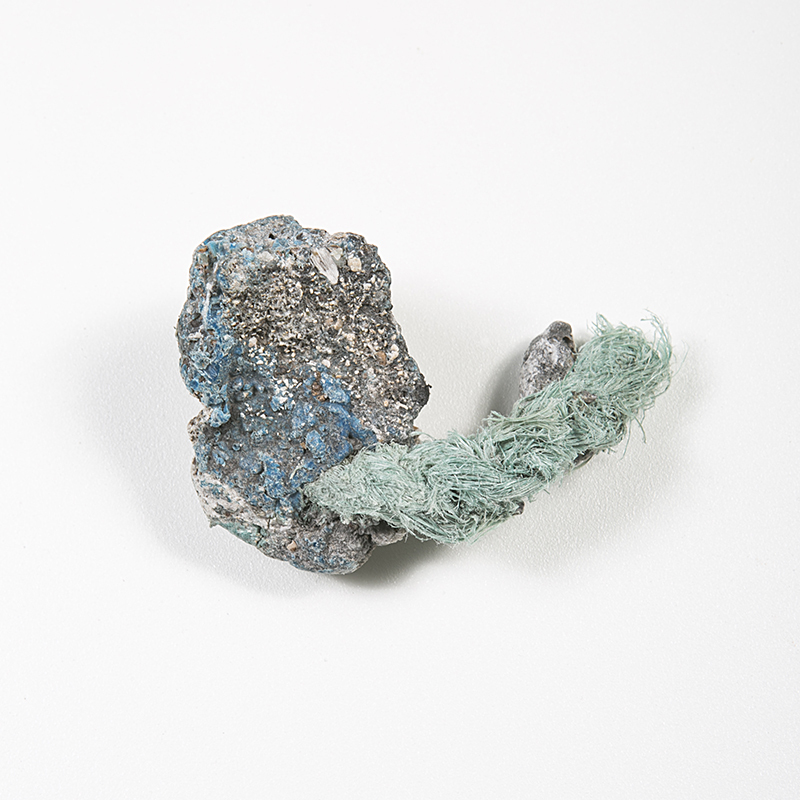 Kelly Jazvac’s Plastiglomerate Samples are currently featured in the exhibition The Future We Remember at the Southeastern Centre for Contemporary Art in North Carolina until June 5, 2016. In August, she sets sail on an expedition of Lake Huron with the largest-to-date, all-woman simultaneous sampling of plastics pollution in the Great Lakes. In October, she will be showing a new, large-scale installation of salvaged billboards at the former site of David Mirvish Books on Art on Markham Street in Toronto. Jazvac has also been long-listed in Ontario for the 2016 Sobey Art Award. W. G. Sebald, After Nature, trans. Michael Hamburger (New York: Modern Library, 2002), 83. Marcel Duchamp quoted in Anne Umland and Adrian Sudhalter, Dada in the Collection of the Museum of modern Art (New York: Museum of Modern Art, 2008), 106. Patricia L. Corcoran, Charles J. Moore, and Kelly Jazvac, “An anthropogenic marker horizon in the future rock record,” GSA Today 24.6 (June 2014), 4. Kelly Jazvac, e-mail communication with the author (20 May, 2015). Patricia L. Corcoran quoted in Rachel Newer, “Future Fossils: Plastic Stone,” New York Times (9 June 2014), http://www.nytimes.com/2014/06/10/science/earth/future-fossils-plastic-stone.html?_r=0 (accessed 15 May, 2015). Whitney Autin in Joseph Stromberg, “What is the Anthropocene and Are We in It?” Smithsonian Magazine (January 2013), http://www.smithsonianmag.com/science-nature/what-is-the-anthropocene-and-are-we-in-it-164801414/?no-ist (accessed 20 May, 2015). Rick Smith, “Stephen Harper: The environment’s best friend,” Toronto Star (31 July, 2015), http://www.thestar.com/opinion/commentary/2014/07/31/stephen_harper_the_environments_best_friend.html (accessed 20 May, 2015). See Chris Hall, “Stephen Harper draws up election 2015 strategy on climate change” CBC News (20 April, 2015), http://www.cbc.ca/news/politics/stephen-harper-draws-up-election-2015-strategy-on-climate-change-1.3054629 (accessed 20 May, 2015). Matthew Ryan Smith, Ph.D., is a freelance writer and educator based in London, Ontario, as well as the curator of the Glenhyrst Art Gallery of Brant. 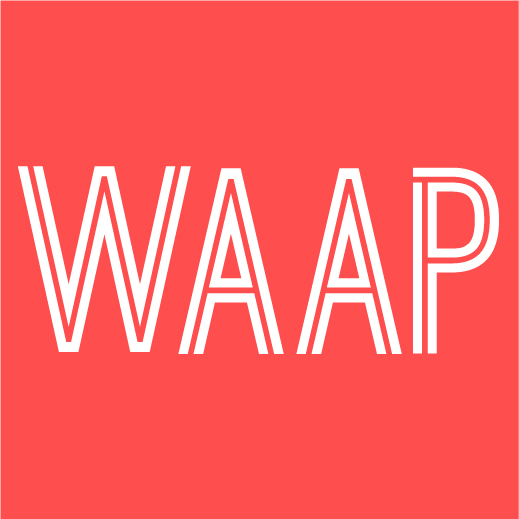 He received his Ph.D. in Art and Visual Culture (Curatorial Stream) from the University of Western Ontario in 2012. He is a Sessional Professor of Art History at the University of Toronto, Mississauga and the University of Western Ontario. Matthew has published extensively in exhibition catalogues, art publications and academic journals, most recently “Relational Maneouvres in Autobiographical Video Art” in Biography: An Interdisciplinary Quarterly and “Performative Appropriation of Video Art on YouTube, Vimeo and Dailymotion” in the Journal of Curatorial Studies. He also recently completed a book chapter on unsanctioned graffiti interventions in post-apartheid Johannesburg to be published by the University of Indiana Press.